While we often get caught up in the 'now' of digital marketing, it's worth also considering the future, and where you should be paying attention to in the years to come. And while virtual reality is the answer most would revert to when thinking about the future of social, what's equally important is how we'll get there, and what, practically, the evolution to these next stages of social communication will mean for you and your business. Looking at the latest apps and developments, the future of social is currently moving most clearly towards two distinct fronts - taking over television as we know it, and into augmented reality. Virtual reality is the extension of AR, and it'll take a while to get there, but while AR and VR are very different, the development of the two is closely linked, and will likely evolve in line. Here's an overview of the next frontiers of social, what they'll mean for your business, and what you can do now to prepare. Last year, live-streaming became the thing in social. While live-streaming, as a practice, has been around for some time, the development of mobile live-streaming - kick-started by the now defunct Meerkat - created a new wave which quickly grew to incorporate several platforms and offer various new choices. But while live-streaming was the impetus, it's certainly not the end goal. Definitely, the capacity to connect with people in real-time, via video, is an evolutionary step, but what the development of live-streaming really highlighted, more than anything else, is that social networks now have the capacity to do something they'd never considered: to take on traditional TV as they dominant media platform. Some would argue that social is already the dominant media player, digital content has disrupted newspapers, magazines and radio to a significant degree, with social playing a big part. But TV remains the big one, the key platform for generating reach and engagement - our homes are literally constructed around the television as the prime communal entertainment source. And as highlighted by various research reports, TV still the winner in terms of time spent. But as you can see in the above numbers, the shift is coming, and the social networks know it. A more recent, indicative report of this trend came from Facebook, which showed that amongst younger viewers the process of consumption is changing. The television, as a device, is still dominant, but the content we view on the TV is different - modern viewers are no longer beholden to rigid programming schedules, networks dictating what they watch and when. Newer options like Netflix provide flexibility, and combined with the wide-scale behavioural adoption of 'second-screening' (consumers being active online while watching TV), you can start to see where the future is headed. This is where the social networks - with a renewed understanding of the capacity of live video, and video programming more generally - can smell opportunity. Live-streaming wasn't the only trigger on this, video content has been on the rise for some time, but the capacity for platforms to provide their own video channels, to become their own video content networks, was awakened by the rise of live video. Now, Facebook's working to develop deals with studios for original programming to air on their platform, Twitter's signing up more live sports broadcasts, Snapchat's looking into more TV-like content. Why? 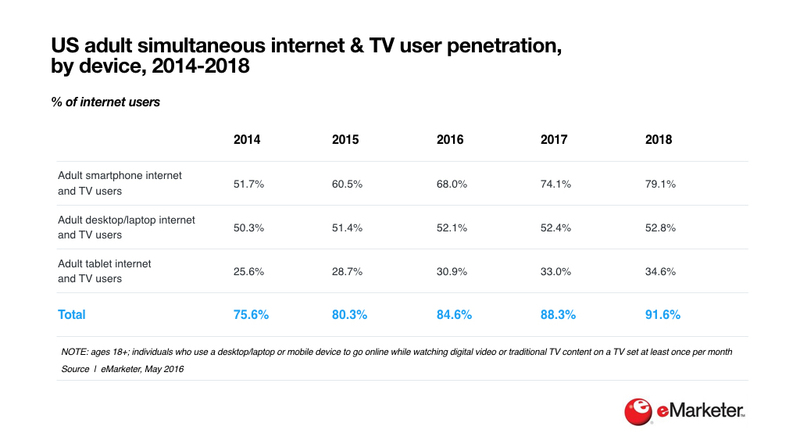 Because that's the way user trends are going - if people are second-screening at such a high rate, and people are becoming more attuned to user-controlled media, do we even need traditional TV anymore? Maybe, the next generation of consumers will get all their entertainment from social. And that shift is significant. The opportunity of social TV is huge - right now, TV is the best platform for broadcasting, for raising brand awareness, for getting the message out there about your products. But it's too expensive for most smaller businesses to consider. But what if, through Facebook TV, for example, you could reach very specific audience subsets with your video ads at a fraction of the traditional TV cost? What if you could create your own live-stream show that would show up as a recommended program for people who've watched content on related topics? Facebook TV - and again, I'm using Facebook as the example here but the same would relate to any of the evolving TV options - Facebook TV would also enable brands to hyper-target their TV ads to specific audiences. How many times have you seen a TV ad come up in a totally non-related program? The broadcast reach of TV is unmatched, but the targeting capacity of social is well-beyond anything possible with current TV focus. This would enable improved targeting for TV ad content, which would reduce the price, while also increasing return. Do you know how much TV advertising is projected to be for 2017? $72.01 billion, in the US alone. 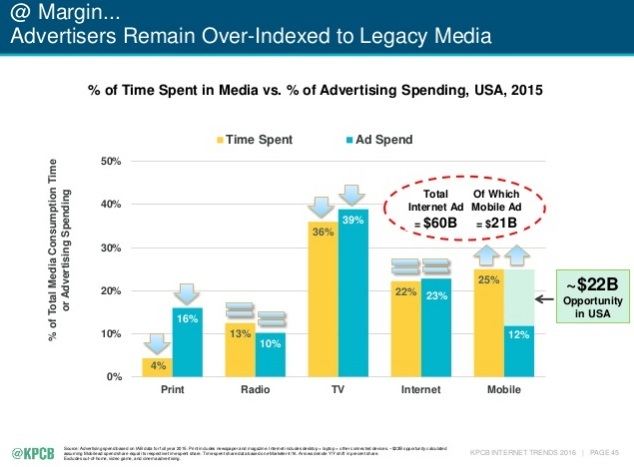 Total digital ad spend is projected to reach a similar amount - tapping into TV ad dollars could effectively double the revenue potential of digital platforms. The impetus on this front is very clear, and as noted, the opportunities are evident. Expect to see a lot more movement on social TV moving forward and start considering how you might be able to produce your own video content in line with this trend. The other key front is augmented reality, which is still a fairly speculative field, considering we haven't seen much on this front before. Sure, there was Google Glass, which came with the promise to change your world (and failed), and there are clips like this from the much-discussed Magic Leap which look amazing. But there's nothing, really, of this type immediately available, there's no concrete comparison that we can use to provide perspective on exactly what's coming. But it is coming. Have no doubt. "[Apple CEO Tim] Cook has likened AR's game-changing potential to that of the smartphone. At some point, he said last year, we will all "have AR experiences every day, almost like eating three meals a day. It will become that much a part of you." Bloomberg says Apple's working on several AR products, including "digital spectacles that could connect wirelessly to an iPhone and beam content-movies, maps and more-to the wearer". Now, again, that's nothing concrete, this is just a report about Apple's purported plans, but the fact is Apple's making big bets on AR, and there may be another key player moving on this front. That being Snap Inc.
As you're no doubt aware, Snap Inc. listed on the stock exchange recently, at a huge valuation, which enabled them to raise more than $3.4 billion. Flush with cash, and facing ever-increasing competition from Facebook, Snap Inc. may have both the impetus and capacity to find an alternative path to maximizing their potential, outside of Snapchat itself. And they may already be on that path with Spectacles. Spectacles, in their current form, are fairly basic in relative terms - they enable you to record film from your perspective. But the next iteration could be much more AR focused. In recent months Snap Inc. has hired various AR/VR experts, including a Hollywood special effects expert, to work on undisclosed projects. Snap Inc. has also filed patents for advanced image recognition ads, and has opened up a new research and development facility in China - close to wear Spectacles are assembled (and away from prying eyes in America). And given Facebook's aggressive moves against the company, you can understand that they'd be keen to keep their new projects quiet - basically, it's impossible for outsider to know exactly what Snap Inc. is working on. But the signals point to a next-level AR tool, like Lenses 2.0. And that could be huge. Worth noting, according to Bloomberg, the global market for AR products will rise to $165 billion by 2024. Snapchat's 2017 ad revenue prediction? $770 million. What's more, Snap Inc. has the cool factor - Google Glass and other tech products on this front have failed partly because they were seen as geeky, because the applications were uninteresting. Most of the major tech innovations start from fun - Facebook was a 'toy' that kids used, Snapchat itself was a 'fad' among teens. It makes sense that Snap Inc. could also be well-placed to capitalize on the potential of AR, if they could do it right. But regardless of which platform moves first, it's clear that the next level of AR is going to be a big deal. Facebook, for their part, seem to looking more to virtual reality straight up, already developing social tools and apps that work within VR environments. And that's clearly where we're headed, but the cost and network limitations will likely make this a longer term goal - augmented reality applications will serve as a gateway to this next level, a stepping stone into the new world of VR connectivity. These are the reasons why you're seeing the various developments you're seeing now, the future we're headed towards, and it's important to consider how your strategy fits, what these new applications and tools might facilitate in time. For example, Pinterest recently released their innovative new Lens tool, which verges on the edge of augmented reality. But the next iteration of that sounds much more AR-like, and could have far more significant brand applications. "We're also building technology that will help people get recommendations on Pinterest for products they discover in the real world, by simply taking a photo. For example, say you spot a coffee table you love either on Pinterest or at a friend's house, soon you'll be able to see how it would look in many different home settings." There are no examples, but that sounds a lot like AR layering, virtually placing a product over a real-world environment to see how it might look. We're seeing similar tools in increasing use by make-up brands and fashion retailers. Those are the kinds of marketing applications that these new tools will provide, and while it's hard to plan for systems that aren't yet available, this is what the next generation of shoppers will have access to, which will in turn raise expectations for all businesses to provide the same. How could AR help you? What could your business do with AR/VR like options? Sometime soon, this may become more than just theory. These are the next frontiers for social marketing. It's worth taking note and seeing how they evolve.